Red Shift Dual Piston Cam Chain Tensioners are a must-have for 2006 Dyna's and all 2007 to present Twin Cams. These tensioners are a direct replacement to improve cam timing accuracy and valve train control at two critical key areas; the drive and driven cam chains. Replacing the original equipment hydraulic tensioners with this new dual hydraulic bodied design will maximize chain stability, restore critical timing events, reduce valve train noise, and improve the lifespan of valve train components; all while improving the overall performance of the engine. The dual-piston design is simple and effective and it is easy to see why it works. When the Twin Cam engine is running, the power pulses rock the tensioner shoe back and forth. On a single piston tensioner design, the natural shoe movement causes the hydraulic piston to momentarily unseat at the base, which interrupts the pressurized oil stream and introduces air into the hydraulic tensioner. Air will diminish or eliminate the pressure that the tensioner shoe places on the cam drive chains, allowing loss of valve train control leading to "bouncing" components including valves, spring collars, rocker arms, pushrods, lifters and camshafts. The Dual Piston Cam Chain Tensioners are designed with shoe and hydraulic stability in mind, eliminating harmful air leaks in the cam chain tensioning system while dramatically improving overall valve train control and durability. It restores critical camshaft timing events for both cylinders, improves throttle response, acceleration and smoothness and increases horsepower and torque throughout the entire RPM range. 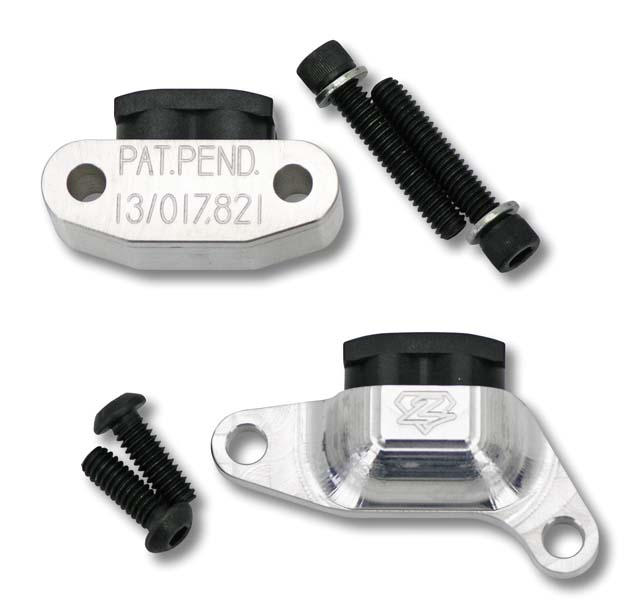 In short, these are the finest tensioners on the market, engineered with superior manufacturing and design. Installation of these tensioners alone will release another 3-4 BHP on a stock bike. They are also great for High Performance applications. In particular with High Lift cams where gear driven cams are no option. Kit includes both primary and secondary cam chain tensioners.